Sport at the elite level has always adopted new technologies to capture data from players during play to better understand their performance and their team's result. Closely aligned with this is the practice of data analytics, and developments here tend to fall into two areas. One is the refinement of existing (or the creation of new) technologies that measure an athlete's activities. The other is the advent of data analysis tools that allow some meaning to be drawn from the collection of this data. Because there is the potential for such a large amount of data to be collected during play, the focus on sports analytics is increasingly associated with what is referred to as big data. velocity – and the refreshing of the data over a period of time. Sport big data is also technology driven with real-time, automated data capture involved in many of the applications. SAP, one of the world's largest software providers for business, has recently created applications for the sport and entertainment industry. The idea is that sport at the professional level generates data from both fans and players, and that to manage and analyse this data the sports bodies will need powerful, real-time cloud-based technologies. SAP assisted the US National Football League (NFL) to set up their Fantasy Football platform that allows fans to access a large amount of historical, contemporary and third-party sporting data. This enabled the fans to not only be more engaged with football in general, but allows them to be better informed in regards to their decision-making capabilities when playing Fantasy Football. It is at the player-level that data capture and analysis can be most influential. Examples of how new or modified innovations are contributing to the sports big data phenomenon are shown in some recently documented player and ball tracking systems. The SportVU player tracking system is an example of how an existing video system can be refined to capture massive amounts of data using cameras. The US National Basketball Association (NBA) has commissioned the technology to be used in all games from 2014, with the data generated being made freely available to teams. SportVU is able to capture 25 data measures per second for each player (and the ball) providing positional information that allows the determination of how many times a player touches the ball, in which part of the court this happens and the juxtaposition of opposing players. The camera system also records and determines player defence and rebounding plays and the proportion of successful shots. Although SportVU makes available a significant amount of data, the analysis of the data is up to each team, allowing them to gain further player understanding. ClearSky was developed by Catapult in partnership with Australia's CSIRO and involves the use of a wearable wireless sensor system that allows players to be tracked during play. The technology can record up to 1,000 data points per second for each player and can be used during a game or training session. This new innovation enables player and ball data to be captured indoors and in stadiums where their physical structure prevent the use of any satellite positioning technology (GPS). ClearSky captures much the same data as GPS-enabled systems but it is some ten times more accurate. 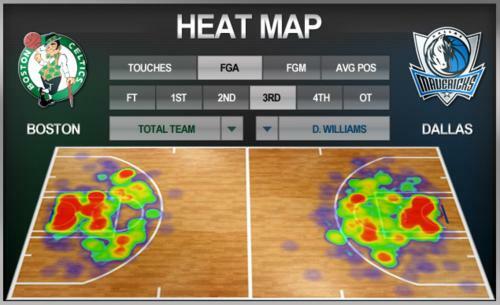 It also includes a real-time player movement analysis feature as well as analytics capabilities. Analysis of that information can then be used to better understand a player's performance. ClearSky has been available from early 2014 and was recently adopted by the Norway's women's and men's handball teams. It would logically be expected that AFL teams playing at the undercover Etihad stadium will use the system. Data everywhere but what does it all mean? Both player tracking systems are examples of how big data can be collected in situations where it was not previously possible, or was too expensive or difficult to collect. The uncoupling of GPS from Catapult's product potentially allows it to be used in situations for gathering player data associated with indoor sporting situation (such as handball and volleyball). Clearly, sport-related innovations are forever being developed so as to allow player performance data to be recorded across just about every sporting activity.